Aszemar Glenn is an ethnomusicologist, composer, concert pianist, and conductor. He has participated in international piano competitions endorsed by the Van Cliburn Foundation and has been feature on regional and public broadcasting television. He earned his Fine Arts degree at Pacific University in the disciplines of Art, Dance, Theater, and Music. Mr. Glenn has numerous achievements in his career, being awarded the OMTA state music award in music composition and two National Endowment for the Arts grants, one in composition the other in performance. As soloist he performed with the Willamette Falls Symphony the world premiere of “Reclere” a piano concerto by internationally known composer Klaus Cornell and in 2005 his own first symphony was performed by the then Oregon Cascade Symphony. In 2011 he wrote a jazz suite for piano entitled “S.S.S” that paid tribute to black jazz artist of past. 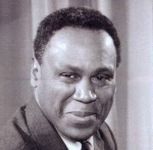 Suite “S.S.S.” was performed by the composer in a lecture style performance called Black Composers of Oregon past and present funded through and presented at the Multnomah County Library, which included Richard Moffatt’s “American Dance Suite”. This native of Portland, Oregon divides his time between penning articles regarding the arts, performances and performance lectures, and working on commissioned music.